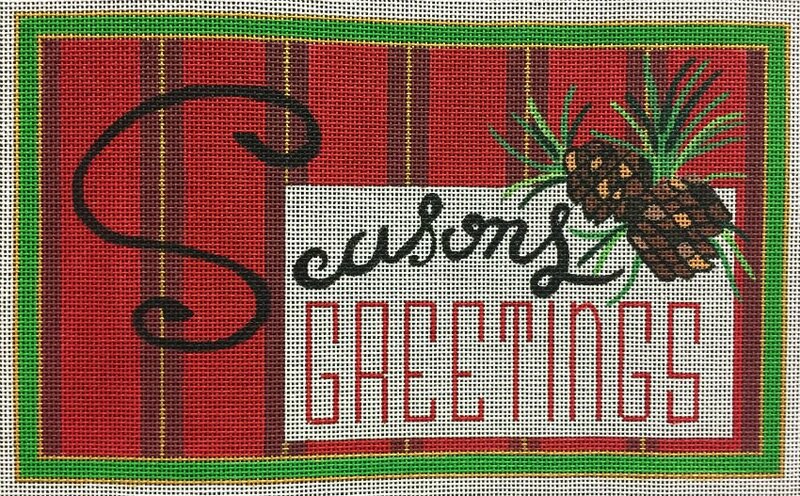 A Seasons Greetings needlepoint HO262 by Raymond Crawford that features Seasons Greetings and a pine cone on Christmas colored stripes. The design area measures 9.75" x 6" and is hand-painted onto 18 mesh mono canvas. You can purchase this Raymond Crawford Christmas needlepoint as canvas-only or with threads. Make your choice from the drop-down menu. If you select cotton we send DMC 6-ply floss or; Bella Lusso luxury wool yarn, or; Planet Earth fiber Pepperpot silk thread; plus some metallic for sparkle! If you require stretcher bars to hold the canvas taut while you stitch then we recommend a pair of 10" and a pair of 14" and some thumb tacks. This canvas usually ships within 1 week. If it is out of stock it will take up to 6 weeks to ship and we will let you know if this is the case (you can cancel the order at this point if you wish). Or ask us in advance when it will ship. We're always happy to handle these inquiries.